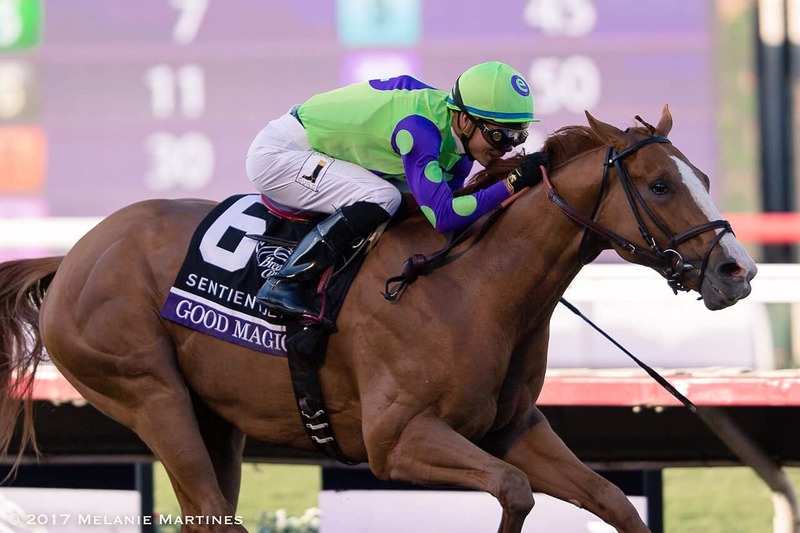 Analysis: The time has come for Good Magic to make his highly-anticipated 3-year-old debut in the Grade 2 Fountain of Youth Stakes this weekend at Gulfstream Park. He’s been working out extremely well for this debut, so the expectations are very high. We’ll get to see if he passes this test and if he’ll continue to be #1 in the rankings. Analysis: He’s still the most hyped of all of Baffert’s 3-year-olds, and that means a lot, as he continues to show up with star horses each week. Solomini did finish ahead of him in their only matchup, the Grade 1 Los Alamitos Futurity, so we’ll have to see how that situation progresses. Baffert took the blinkers off for his most recent start, and the horse responded with an ultra-impressive performance. My Boy Jack winning the Grade 3 Southwest Stakes flatters McKinzie after the son of Street Sense easily defeated him in the Sham. Analysis: This son of Curlin exudes class with runner-up finishes in the Grade 1 FrontRunner Stakes and the Grade 1 Breeders’ Cup Juvenile. In his most recent start, he crossed the wire first but was disqualified in a very controversial call. That race has already produced FOUR total next-out winners, which flatters Solomini in a big way. Analysis: He had the most talent of this crop as a 2-year-old, but a tough trip in the Breeders’ Cup Juvenile caused him to finish third. However, he is a multiple Grade 1 winner and has won in dominating fashion. A jockey switch to Javier Castellano is a major bonus, too, and he’s set to make his 2018 debut in the Grade 2 San Felipe Stakes at Santa Anita on March 10. Analysis: Avery Island had a tremendous 2018 debut, easily taking home the Withers. The New York route to Kentucky seems logical for him, as all of his big victories have come over the Aqueduct surface. The win was also at a mile and 1/8, which was his second solid effort at that distance. Analysis: He ran well to finish second in the Holy Bull after a layoff that followed a very disappointing effort in the Breeders’ Cup Juvenile. His race at the Breeders’ Cup was the only time that he’s ever finished off the board, so he has to be considered a major player. He’ll likely improve in his next start. Analysis: He made his 2018 debut in the Sam F. Davis, and while he didn’t run poorly, it was disappointing that he couldn’t pass Flameaway in the stretch and had to settle for second. There’s still reason to be optimistic, but he must improve in his next race. Analysis: Many may think that he’s ranked too highly after finishing third in his 2018 debut race, but he should improve off of that effort next time out. His trip in the Southwest was less than ideal, and the sloppy track played strongly to horses on the inside. The race was just what he needed going forward. Analysis: The Coach is back in the Derby! Bravazo shipped to Fair Grounds for the Risen Star and pulled off a 21-1 upset over a field loaded with Kentucky Derby prospects. The Awesome Again colt has developed greatly as a 3-year-old. He’s now two-for-two in 2018 and will likely return to Fair Grounds for the Louisiana Derby. Analysis: This solid, consistent horse has been steady in both of his 2018 starts. As a juvenile, he won the $150,000 Jerome Stakes, then had a nice run in the Withers to finish second. He might be best when going one turn, but his 1 1/8-mile Withers performance shows that he is at least serviceable when going longer. Analysis: His fourth-place effort in the Risen Star left a lot to be desired, but it wasn’t enough to remove him from the rankings completely. He seemed a little dull in the race, but he still managed to run well enough to be close to the leaders in the end. Perhaps shipping back and forth to Fair Grounds from California took its toll on him. Owner: Frank L. Jones Jr. Analysis: Although he was a distant third in the Holy Bull, he might improve off of his next start, as Romans horses usually succeed with more and more racing experience. He is a drop-back-and-make-one-run type that can win when the pace gets hot up front. Analysis: The Risen Star was a solid first try against stakes company. He ran well to finish third while up against a small track bias and has a right to improve as he goes forward. At this point, all options are on the table as to where he’ll start next. Analysis: He ran well enough to catch our attention in the Sam F. Davis and is a horse that should love going longer. He has a chance to really excel when it means the most. Jockey John Velazquez has already committed to ride him in the Grade 2 Tampa Bay Derby on March 10th. Analysis: Could this be the Lookin At Lee of 2018? He’s finished second in three straight Kentucky Derby prep races, but he just can’t seem to have things go his way enough to pick up a win. His Southwest effort was another positive start, and he should continue to make an impact along the Kentucky Derby trail. Analysis: The Sam F. Davis was his first start on a fast dirt surface, and he seemed to relish the ground, as he won the race while holding off the heavily-favored Catholic Boy. We’ll need to see him prove it again before we totally buy in, but there’s no doubt that he served notice as a horse to watch. Analysis: He looks like the Always Dreaming of 2018. Magnum Moon picked up two nice victories in a row, including an allowance race at Tampa Bay where he basically schooled behind horses before winning for fun down the stretch. After passing that test with flying colors, he’s now being pointed towards a Derby prep race. However, he’s also racing against the clock, as he has just two starts, none of which came as a 2-year-old.